Economic forecasting is easy. Anyone can fill in a spreadsheet with their best guesses of how GDP growth, inflation, and central bank policy rates will unfold and call it a forecast. There are no professional standards or guidelines that must be met to publish a forecast. An economist I once knew often said his goal in making forecasts was to be "100% memorable and 51% accurate". Forecasting accurately is extremely difficult. This is partly because unexpected events or shocks are constantly buffeting economies. It is partly because economic data is published with some delay and is often significantly revised later, especially at cyclical turning points. This means that, at any point in time, even analysts who follow the economic data closely have an unclear picture of the current state of the economy which is the starting point for their forecasts. This makes it more difficult, even for the best analysts, to accurately foresee inflection points in growth and inflation. As I have written elsewhere, another issue for forecasters is what is known as the "optimism bias". The optimism bias in economic forecasts is well documented and widespread. In a 2011 study for the US National Bureau of Economic Research, Jeffrey Frankel found that for 33 countries, on average, the upward bias in real GDP forecasts is 0.4% when looking one year ahead, 1.1% at the two-year horizon and 1.8% at three years. Despite Frankel's findings, forecasters retain their optimism bias. In recent years, this bias has had a seasonal component, with optimism seemingly peaking in December-January as year ahead forecasts are publicized. 2015 is proving no different. The table below presents revisions in 2015 growth and inflation forecasts for the twelve economies that I regularly monitor in this blog. The table compares forecasts made at the turn of the year with revised forecasts published last week by two of the very best global forecasting organizations, the International Monetary Fund (IMF) and JP Morgan Economics (JPM). For real GDP growth, there are substantial downward revisions across a wide range of countries. [Note that revisions to global growth are smaller, but this appears to be due to shifts in purchasing power parity (PPP) weights toward higher growth economies like China and India]. With all of the recent angst over Grexit and the bursting of China's stock market bubble, it is perhaps surprising that the largest downward growth revisions are not in Europe or Asia, but instead in the Western Hemisphere. The most significant downward revision is for the world's largest economy, the United States. The IMF has downgraded its' dizzying 3.6% forecast for US growth to 2.4%, while JPM has cut from 3.0% to 2.2%. The downgrade to US growth has cascaded through the hemisphere, with Mexico downgraded from robust to moderate growth, Canada downgraded from moderate growth to near-recession, and Brazil downgraded from virtually no growth to outright recession. By comparison, growth downgrades are more moderate for Japan, the UK, Australia and Korea. There is a notable growth upgrades for India. Growth forecasts for the Eurozone and China are little changed, as is Russia's recession forecast. This is where the optimism bias continues to rear its' head. Do forecasters really believe that the disappointments in Western Hemisphere are over and that the recent turmoil surrounding Greece and China will have no impact on Eurozone and Chinese growth? Could the turmoil be a harbinger of further problems within these large economies? 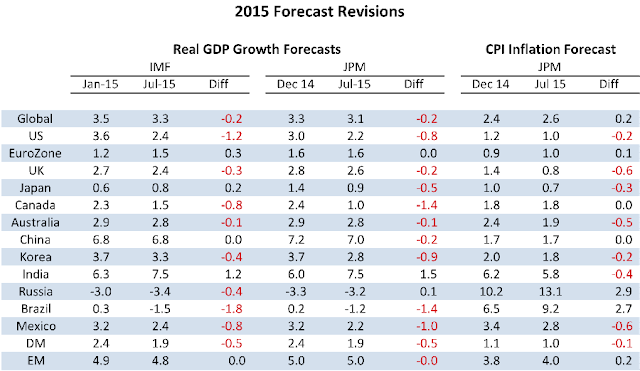 Revisions to inflation forecasts are more mixed. The big change to factor into 2015 inflation forecasts has been the collapse in the price of crude oil over the past year. Most of the decline had occurred by early in 2015 and was being taken into account in turn of the year forecasts. These forecasts have been complicated by the effects of some large exchange rate movements. On balance the largest downward revisions to end-2015 CPI inflation forecasts have been in the UK, Mexico, Australia and India. These downward revisions have been offset by large upward revisions to year-end inflation forecasts for Russia and Brazil, where exchange rate depreciation is pushing up inflation despite the economies being in recession. There is no change in China's 2015 inflation forecast at 1.7%, despite inflation having averaged just 1.3% in the first six months of the year and despite clear signs that growth is slowing, that house prices are falling and that confidence has been shaken by the recent stock market crash. The forecast revisions since the beginning of the year mainly reflect disappointment that overly optimistic growth forecasts have not been met. From a policy perspective, this has meant unexpected monetary policy easing in some countries and a delay in tightening policy in others. Among the economies monitored here, central banks of Canada, Australia, Korea, India and Russia have all provided policy rate cuts that were not expected at the beginning of the year, while Japan and the Eurozone have added to their QE bond purchase programs. The US and UK have delayed raising their policy rates. In this environment of widespread downward revisions to growth forecasts, more moderate and mixed revisions to inflation forecasts and unexpected easing of monetary policy, asset markets have provided little gain and plenty of volatility. 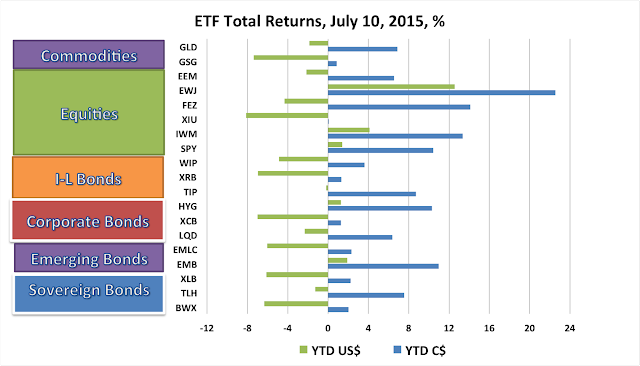 The chart below shows year-to-date ETF returns for the the major asset classes in both USD terms (green bars) and CAD terms (blue bars). With the exception of Japanese equities (EWJ, which returned over 12%), USD returns on these ETFs have been weak, ranging from -8% for Canadian equities (XIU) to +4% for US Small Cap stocks (IWM). Of course, when a 9% appreciation of the USD vs CAD is factored in, Canadian dollar investors (who did not currency hedge) enjoyed positive returns on all of these ETFs. Commodity returns were negative in USD terms. Eurozone (FEZ) and Emerging Market (EEM) equity returns were negative. Inflation-linked bond ETF returns were negative. Credit ETF (LQD and XCB) returns were negative in USD terms, with the exception of US High Yield (HYG). In Emerging Market bonds, those denominated in USD (EMB) had positive returns, but those denominated in local EM currencies had negative returns. US 10-year Treasury bonds (TLH) and non-US government bonds (BWX) also had negative returns in USD terms. Hopes raised by the giddy economic forecasts made at the turn of the year have been dashed. Only those investors who played the currencies correctly have made any money this year; the underlying asset values have been eroded by disappointing growth, weak commodity prices, and fears that (sometimes desperate) monetary policy easing will be ineffective and/or ultimately reversed. The biggest question mark for the remainder of the year is China. The bursting of the previously surging Chinese equity bubble has led the government to take unprecedented steps to stabilize the stock market that could yet backfire. A full-blown Chinese financial crisis would be devastating to still optimistic global growth and inflation forecasts.